It’s a terrifying thought. You are on an outing with your dog, enjoying the day, and all of a sudden your world is turned upside down because you have been involved in a car accident and your dog has been thrown from the vehicle. Sadly, it is a fairly common occurance. But there is hope! This article will give you some tips on what we have learned from our experience regarding the best way to recover a dog lost from a car crash. Due to the trauma of the crash, these dogs immediately fall into our “Shy Dog” profile and will generally behave as a shy, fearful dog, even though they may have a friendly personality. Dogs lost from car accidents are usually quite predictable in their actions and can be successfully recovered if everyone who is helping the owner understands lost dog behavior and agrees to follow some guidelines. Unfortunately, sometimes the owner is in the hospital and is unable to assist in the recovery. Without strong, educated leadership from the volunteers helping, the recovery efforts can swiftly go off course. The first thing to remember is that dogs lost from car accidents do not usually venture far from the scene of the crash. They may bolt at first but then they usually hide and may creep back to the crash location shortly after the accident (often the first night). OR they may go further afield but then circle back around to the crash site in the upcoming days. Use scent articles (the dog’s bed, toys and dirty articles of the owner’s clothing or bed sheets). This will help will keep the dog in the area. Place them near the crash site but well away from the road along with smelly, tasty food and water. RULE NUMBER ONE*: Never call, chase, whistle, pressure or pursue a scared lost dog. You risk chasing him away from the area and possibly into traffic, endangering his life. The most frequent mistake we see is well-meaning but uninformed Good Samaritans who want to jump in to help but do all of the wrong things, including bringing large groups of people (search parties) or strange dogs, ATV’s, horses, drones, etc. to the site of the crash. This invariably drives the dog out of the area, requiring the owner or the volunteers to flyer an ever expanding radius. Sometimes there are people who wish to profit off the situation and will offer services for a fee. Make absolutely sure they are knowledgable and reputable before enlisting them. Make sure that they aren’t going to do any of the things listed above (tracking dogs, drones, etc.) It may be wiser to avoid fee-based services altogether because it can be difficult to do the due diligence required to check them out during this stressful time. Instead of “searching”, volunteers should be enlisted to quickly print and deliver flyers or do driveway drops in the surrounding neighborhoods to try to generate sightings in case the dog does not quickly return to the crash site. Make sure there is a reminder on the flyer that people should not call or chase the dog. They should simply call the number on the flyer immediately. The greatest risk to a shy lost dog is that he will be chased into traffic and killed. The second greatest risk to a shy lost dog is that he will be chased into a body of water or onto thin ice and will drown. 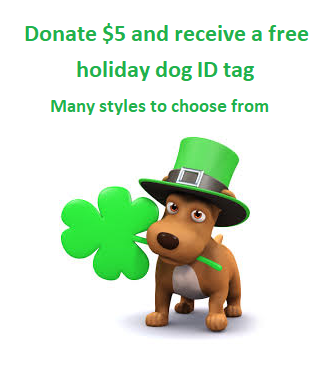 Do not offer a reward for your missing dog (click herefor more info) . Rewards encourage people to chase the dog and can lead to the problems mentioned above. Unfortunately, flyering is not as emotionally rewarding as trying to catch the dog, and the volunteers recruited to flyer may lose interest quickly and disappear. If the owner lives far away, or is in the hospital, they may be unable to flyer themselves and they may give up due to logistical or financial reasons. Social media is wonderful but hand delivering flyers door to door in the area where the dog is missing is the Number One way that lost dogs are found. Posting flyers on bulletin boards and utility poles is not enough and may be illegal. Affixing flyers to poles is dangerous to the utility workers. Intersection signs are also very useful to alert passing motorists about the missing dog. Remember to get permission before using intersection signs or you may be disappointed when they are taken down because they violate municipal ordinances or home owners’ association rules. If you live outside the area, and your volunteer helpers are unwilling to do the hard work of door to door flyering, you may need to use a service such as the United State’s Postal Service Every Door Direct Mail. Read more here. There are other services available also, such as Pet Harbor’s Postcard service. Details are here. Robo-calling services, although very useful in years past, have diminshed in effectiveness because of the increased use of cell phones and the decreased use of landlines. We no longer feel they are an effective way to get the word out. People also tend to ignore voicemail messages that they perceive to be spam. What if I See the Dog? If you see the dog, immediately sit on the ground facing away from him and toss a few tasty treats behind you. Do not make eye contact and speak softly or not at all. It may take a few minutes, or a few hours, but the dog may approach you. They will usually approach from behind. Most people give up too soon and then stand up and start walking towards the dog and chase him away. Be patient! But if he doesn’t approach and you have to leave, put a few treats on the ground and leave the area without looking at the dog. Allowing him to settle and relax is a far better strategy than trying to chase him. Lost dogs that aren’t being chased will make wise decisions and may survive indefinitely. When is Too Much Media Coverage Too Much of a Good Thing? Car crash lost dog cases elicit a lot of sympathy from the public, social media and traditional media. Unfortunately this can work against your efforts. Highly publicized lost dog cases often backfire. Too much media can be detrimental to your lost dog search because the additional pressure from the public can chase your dog out of the flyered area or worse yet, into the path of traffic. The dog may also become nocturnal resulting in fewer sightings. Read more here. Be patient. Dogs lost from car accidents may hunker down for a day or two and then creep back to the site of the crash – lured by the tasty food and scent items you left. Please read through the rest of our articles on Shy Lost Dog Strategies and Humane Trapping. Never give up! Your lost dog is counting on you to bring him safely home. *The only exception to this rule may be when you know the dog has been seriously injured in the crash. Only in this circumstance should a shoulder to shoulder grid search be used to search for the injured dog who may be hunkered down and hiding. Unfortunately, shoulder to shoulder grid searches are usually improperly done and the hiding hurt dog is not found because the walking searchers were too widely spaced. 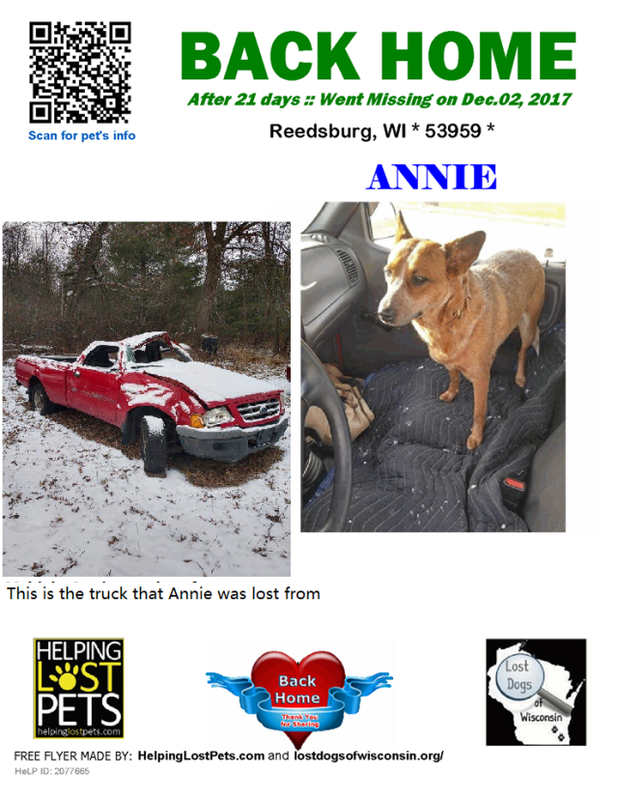 Annie, the dog featured in the photo above was successfully recovered after being lost from a truck roll over in Wisconsin. Read the owner’s story here. 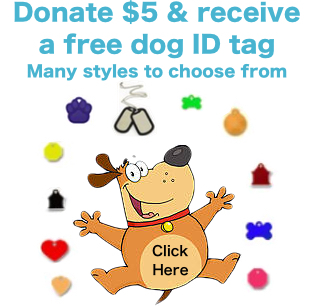 Our tips, ideas and articles are based on information gathered from thousands of successful lost dog recoveries. Any advice or suggestions made by Lost Dogs of Wisconsin/Lost Dogs Illinois is not paid-for professional advice and should be taken at owner’s discretion. This entry was posted in Shy Lost Dog Strategies and tagged car accidents on April 12, 2018 by Susan.